Water repellence develops when there is an accumulation of hydrophobic organic substances in a susceptible soil. Hydrophobic compounds are derived from plant and microbial sources. Sands are more susceptible to developing water repellence than clays as they have a smaller soil surface area that are readily coated by hydrophobic substances. Water repellence results in poor water infiltration, variable soil wetting, increased erosion risk and reduced and delayed crop, pasture and weed establishment. Hydrophobic compounds are derived from living and decomposing plants and soil micro-organisms. Soil water repellence is a by-product of these organically-derived hydrophobic residues coating the soil particles. Plant-derived hydrophobic substances includes leaf waxes, resins, aromatic oils and fatty acids. The waxy substances from plants consist of long-chain hydrocarbons, fatty acids and alkanes (paraffin-like compounds). Waxes on plant leaves and stems are important for reducing moisture loss from the plant, frost hardiness, drought resistance and enhances the self-cleaning of leaf surfaces. Decomposing organic matter is a source of hydrophobic substances but the process is dynamic and hydrophobic compounds are both released and degraded during the decomposition process. 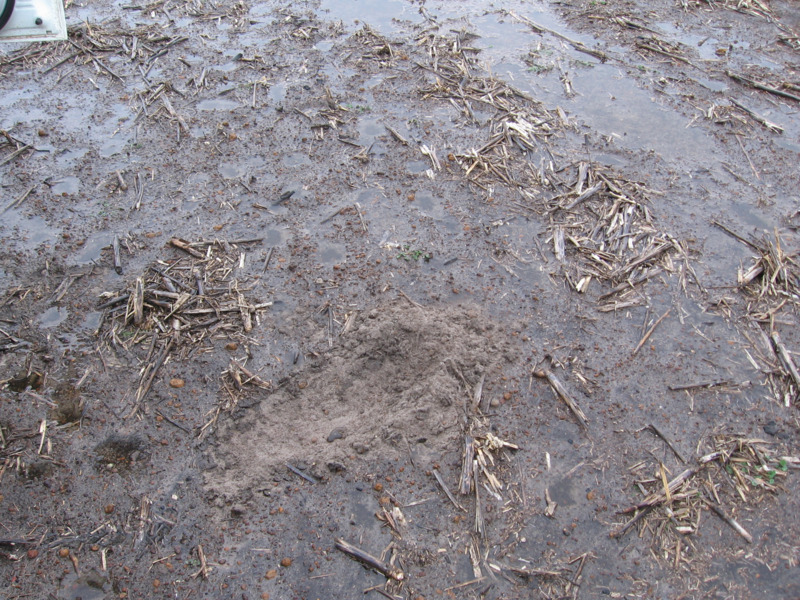 In our dryland farming systems, lack of moisture for much of the year limits the decomposition rate and the degradation of these hydrophobic substances by soil microbes. Hydrophobic substances can diffuse out of decomposing organic materials and off of soil surfaces under summer heating and cooling cycles and are then redistributed in the topsoil. This process can make the adjacent sand grains hydrophobic and can result in hydrophobic layers forming just below the soil surface. More than 50 plant species have been implicated in developing water repellence. Clovers and blue lupins (Lupinus cosentinii) are known to increase the severity of water repellence. In native vegetation there is a strong link between particular species, for example, Eucalyptus astringens (brown mallet), Eucalyptus patens (blackbutt) and Banksia speciosa (showy banksia) and the induction of water repellence. Sheep camps tend to be more water repellent because of the accumulation of organic matter and the waxy substances in plants are not effectively broken down by their passage through the sheep. The soil property closely linked to susceptibility to water repellence is soil surface area as determined by the soil texture. The amount of hydrophobic compounds required to inhibit water infiltration in sands is relatively small due to the low surface area of sand. Generally, the coarser the sand, the less organic material is required to produce repellence. In coarse sand only 1-3% of hydrophobic sand grains are required to inhibit water absorption and infiltration in an otherwise wettable soil. As the surface area and charge of the soil increase, as in the case of clay soils, more hydrophobic grains are required to inhibit water absorption and infiltration. Clay also improves the soil microbial habitat which can result in increased microbial degradation of hydrophobic organic matter. Clay has a much larger surface area than sand because it consists of much finer particles. Soils with more than about five per cent clay content rarely exhibit repellence; coarsely-aggregated clays and soils with an abundant supply of hydrophobic material, such as beneath brown mallet hilltops, can be exceptions to this general rule. Here the hydrophobic material coats the outsides of clay peds to encourage run-off. If the peds are crushed dry, the resulting soil is not hydrophobic.